Next to tire pressure and chain lubrication, motorcycle chain adjustment is among the most ignored simple maintenance tasks. Even though chain tension (slack) and rear wheel alignment is a major factor for the longevity of both the chain and tire. Not to mention the motorcycles handling, as well as basic safety. To see what happens when a motorcycle chain falls off due to neglecting it, see a short video. The saddest part is that it could have been totally avoidable with less than an hour of time and a few tools following this process. Here we’re going to go over basic motorcycle chain adjustment. That is, how to check the chain slack and adjust chain tension, as well as align the rear tire. We’ll be working on a 2017 Kawasaki Ninja 650 ABS. 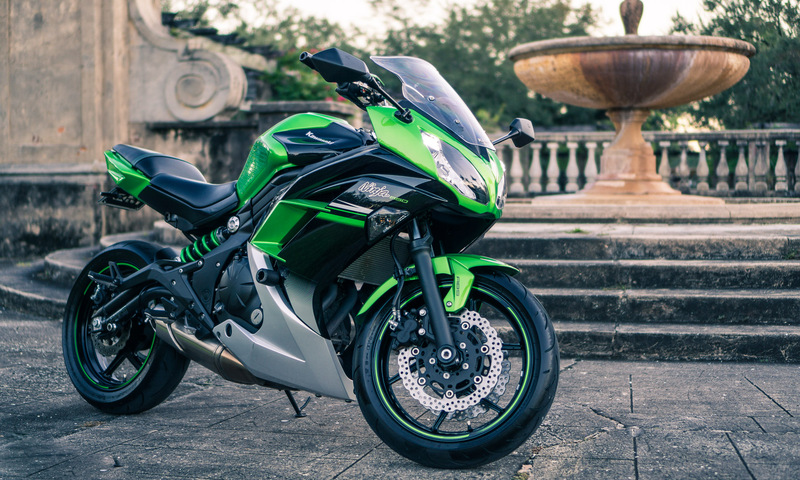 It would also be exactly the same process on the 2017- Kawasaki Z650. On most modern bikes, the process is extremely similar. So, regardless of what bike you ride, you should find some value in this tutorial. How often do we have to tackle motorcycle chain adjustment? Per Kawasaki’s engineers, the chain slack should be checked every 600 miles. If you trusted them to build the bike you bought, trust them to know how to maintain it. Per Kawasaki’s enginerds, the chain slack should be checked (and adjusted if necessary), every 600 miles. You should check the rear tire alignment simultaneously, and adjust if necessary. There are those that would recommend you check it before every ride (at least visually), but that’s way too often for most people in practice. The good news, however, is that while you really should check it about every 600 miles or once a month, you will rarely have to adjust it. And to check it, it only takes about fifteen minutes, so don’t procrastinate. Remember, the alternative. Also worth mentioning is that the most important time to check the chain tension and rear tire alignment is during the first 500-1000 miles of the bike. That’s when the chain will suffer its initial (and most significant) stretch. This is one of the important things the glorified ‘first service’ should take care of – which I totally recommend you save the coin and do yourself. Moral of the story is check it often, adjust it sporadically, and don’t forget about it. We’ll need a small variety of tools for this job. Some basic, others motorcycle specific. Thankfully, all the tools are cheap and worth having around. With all routine maintenance tasks, doing the work yourself (in lieu of a mechanic) will save you time and money. That makes it worthwhile, both time-wise and economically, to get any tool that makes the job easier or quicker. This is one of those tools. Checking chain slack with this is much, much quicker and easier than using a ruler. Plus it gives you much more consistent results. For the price it’s a no brainer for any motorcycle owner. However, in a pinch a regular foot long ruler can work just as well. There are many ways to check chain alignment, however the best, quickest, and easiest method I’ve found so far is this tool. Other options are simply to use the hash marks on the frame, string, or tape measure. But for doing it on a regular basis, nothing beats its precision and speed. 1/2″ Drive Torque Wrench – To set the right torque on the rear axle nut. Breaker Bar – To break loose the rear axle nut. 1/2″ Socket Drive Ratchet – Needed to apply counter torque to the axle when loosening or tightening its nut. 22mm and 27mm Socket – For the axle nut and axle bolt head, respectively. Be aware that these sizes are typically not included in normal ratchet kits. Pliers – To remove the cotter pin on the rear axle nut. Cotter Pin – 4.0x35mm – To secure the rear axle nut. It isn’t ideal to reuse the original cotter pin, but in a pinch you can do it. The OEM size per Kawasaki is 4.0x35mm. It’s part 550AA4035 at around 3$ per pin. But any similarly sized cotter pin can be used. Typically it’s cheaper and more worthwhile to just buy the kit and use the size you need, keeping the rest as spares. If you’re performing this DIY on a 2012-2017 Kawasaki Ninja 300, the 22mm and 27mm sockets are not needed. The Ninja 300 uses 17mm and 24mm sockets, respectively. The first step is to put the bike up on a rear stand. See how these spools have a spacer separating them from the swingarm, and a deep groove? That will keep the stand’s yoke away from scratching the swingarm, as well as much more securely in place. For this job, I’m going to use a rear stand, which attaches to the spools. If you don’t have rear spool sliders already, then now would be a great time to get them. Luckily they’re cheap and can be installed in seconds. Plus, in theory they also work as frame sliders. One note though. There is controversy on whether the chain slack should be checked on the sidestand or a rear stand. In either case the swingarm is loaded, so both I and a majority of motorcycle owners check and adjust the chain tension while on a rear stand. Mostly for convenience and speed. On the 2017 Kawasaki Ninja 650 there isn’t any differently colored master link on the chain. I recommend marking the chain with a permanent oil pen so you know where you started and where to end when lubricating the chain. Plus, they’re perfect for touching up paint scratches and chips. This is the tool I use for measuring chain slack. Simply place it as pictured, and move the arm up and down to get the chain slack. In this case we measured over 35mm of chain slack, which is too much and should be corrected immediately. On the chain guard (which we previously removed) we can see the correct chain slack and how to measure it. Also, This would also be a great time to double check tire pressure. 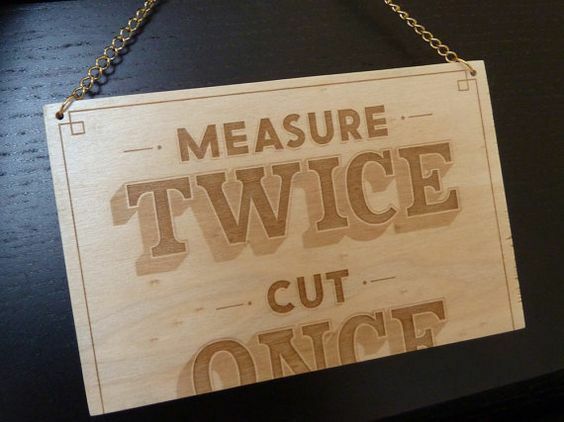 Remember to always measure from the same point. It’s tempting to measure from the extremes of the link but that would be incorrect. The first step is to measure the initial chain slack. The correct chain slack (for this bike) is 20-30mm when measured roughly at the middle of its length. In this case we measured 35mm which is out of spec and too loose. Keep in mind that if you measure a value between 20-30mm, the chain slack is correct and you don’t have to do anything. That sure cuts short the motorcycle chain adjustment! When the manual says “check every 600 miles”, you should really do so because most of the times it’s only checking. In practice you probably won’t have to adjust your chain more than every 2-3k miles. So, if you get a value that’s well within spec, skip to step 13. I personally used a Chain Slack Tool because it’s a lot easier than fiddling with a ruler. Anything that makes you more likely to keep on doing a routine maintenance task is worth it, and this is one of them. Simply hold the top of the tool against the bottom of the swingarm, put the yoke around the chain, and move the arm up and down. Remove the tool and read the value. If you’re using a ruler, remember that you have to measure at the same point of the chain link. Either top, center or bottom – Choose one and stick with it. This means that you want to measure from the top of the link (for example) when pushing the chain up, and at the top of the link when pushing the chain down. It’s tempting to measure at the top when it’s up and at the bottom when it’s down, but this would be the wrong way to measure it. Take a look at the diagram above if this is unclear. One reason why I use the chain tool is to avoid this issue altogether. You have have to remove this rubber cover to expose the axle nut. To remove the rear chain cover, we have to remove two bolts. Now that everything’s exposed and easily accessible we’re ready to start working. Now that we know we have to adjust the chain tension, let’s begin the prep. Don’t skip this. Take a moment and remove the rear chain cover to make your life easier as well as reduce the risk of scratching it when removing the cotter pin (guess how I know). All it takes is two easily visible and accessible allen bolts. Also, remove the rubber cover on the axle nut. I’m not sure if Kawasaki intends that to stay there (I believe so), but I have no idea why. Bend the arms straight again so it can be removed. Pinch them together as well as possible to make the pin easier to pull out. Carefully pull it out. If it doesn’t want to move, try leveraging with a screwdriver (or the pliers itself) but be careful to not bang the swingarm or any fairings if the pliers lose grip on the cotter pin. Now we have to remove the Cotter Pin. The OEM pin is very strong and stiff so be careful to not let your pliers slip when pulling it out and bang something delicate. The trick is to bend it as straight as possible, until it can easily be pulled out. Or you can just cut it with some cutting pliers. If you already have a breaker bar, you know how useful they are for jobs like this. If you don’t, you may be skeptical, but they are a staple in any garage for a reason. It makes removing high torque (or seized/stuck) bolts much easier and safer. We are going to want to hold this side (the bolt head side) still while loosening the opposite side. Loosen the nut side while keeping the opposing side (the bolt head) from rotating. To begin the motorcycle chain adjustment we have to loosen (but not remove!) the rear axle nut. We will need a 27mm socket for the nut side, and a 22mm socket for the bolt head side. Be aware that these are not typical sizes and are probably not included in your standard socket set. Keep the bolt head secured in place with one hand, and loosen the nut side. Don’t do the opposite, namely try to remove the bolt side with the nut held still. This is because then you’re rotating the entire axle, which is simply unnecessary. Though this can be done with wrenches and small ratchets, 6 point sockets (opposed to 12 or more) and a long breaker bar make the job much easier. It also reduces the risk of damaging either the bike or yourself. You only want to loosen the nut enough to be able to rotate it freely by hand. Also, don’t remove it completely. These two nuts are locked together. Hold the larger nut (14mm) still while loosening the 12mm nut. Adjust the nuts, measuring the chain slack constantly, until you reach the right value. If the chain was too loose, tighten the 14mm nut slowly to tighten the chain. The only purpose of the 12mm nut is to secure the 14mm nut once you’re done. Once the chain slack has been properly adjusted, it should be between 20 and 30mm. To adjust the chain slack we need a pair of 12 and 14mm spanners. While holding the big nut steady with the 14mm spanner, loosen the 12mm nut. Once the 14mm nut is free to move, tighten it clockwise in one-quarter to one-half rotations measuring the chain slack constantly until it tightens up to around 25mm of chain tension. This taking for granted the chain was too loose. Once the chain tension is properly set, hold the 14mm nut steady and rotate back the 12mm nut until they both lock together. You don’t need threadlocker given how both nuts secure each other, but you can apply it if it makes you feel better. Sometimes I do. Typically, during routine motorcycle chain adjustment I tend to find that the chain tension is too loose. As opposed to finding the chain too tight after several hundred miles. But that doesn’t mean that sometimes you won’t find it so. If that’s your case, loosen up both nuts and give the rear tire a push forward. Do it while holding the bike and rear stand steady. This will loosen the chain (increase chain slack). Then simply proceed as above for loose chains. I find this tool much more reliable and trustworthy than the hash marks on the swingarm to adjust the rear wheel’s alignment, not to mention quicker. Looking at the rod with one eye, you can tell that the rear sprocket is not aligned with the chain if the rod looks like this. As you can see, the rod is not parallel to the link plates, but rather crosses from the inside to the outside of them. 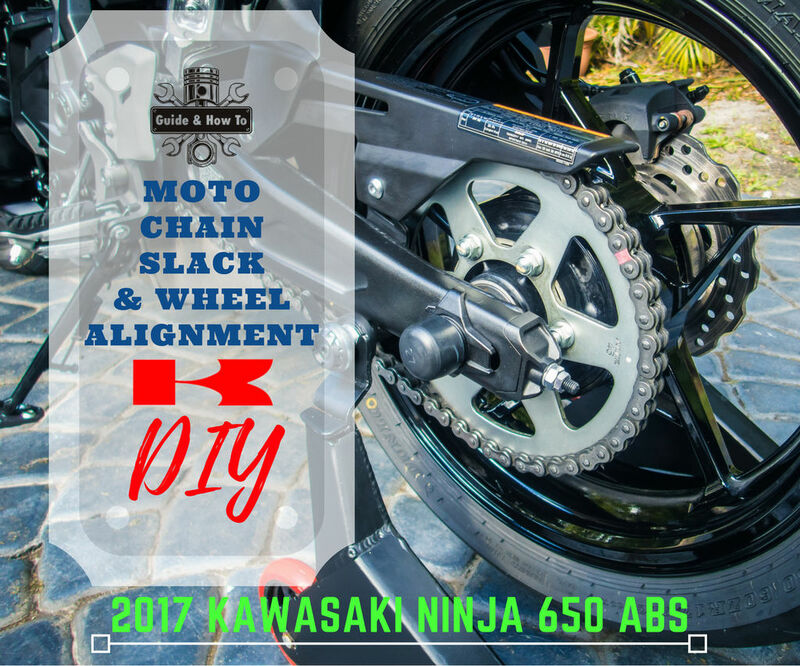 Similar to the chain tension, adjust the nuts on the right side of the swingarm to change the rear tire alignment until the sprocket is aligned with the chain. After adjusting the nuts, this is how the rod should look when the sprocket is properly aligned with the chain. As you can see, the rod is perfectly parallel with the link plates. After adjusting the alignment, we can double-check it using the hash marks on the swing arm. The gauge should be at the same position on both sides of the swingarm, however they are frequently not all that precise and the mechanism has quite a bit of play. Personally I use these marks only to make sure there aren’t major issues, or for double checking. Both hash marks should be at the same position on both sides of the swingarm when properly adjusted. Whenever you loosen the rear axle nut, you should check and readjust the rear tire alignment. This means that any time you adjust the chain tension you will have to adjust the rear tire alignment. And vice-versa applies, too. So basically it’s an integral part of motorcycle chain adjustment. There are many ways to adjust alignment, with the easiest being simply using the hash marks on the swingarm. However forums abound with comments about how the swingarm’s marks aren’t precise, so I like using a specific tool. For quick and painless checking on a routine basis, I use a Chain Alignment Tool. I’m sure a nice gadget like a Laser Chain and Belt Alignment Tool would be even better, but for the price it’s not worth it. One benefit this tool has over measuring tape is that you can quickly look at it at any moment. Even mid-alignment adjustment. It sure beats having to stop and take measurements all over again after a quarter nut turn. To use the tool, first clamp it on the rear sprocket. Then look at how the rod aligns with the chain. You’ll quickly see if the rear tire aligns with the chain or not. And though the rod looks shortish, you can easily align it visually in such a way that it projects against the whole length of the chain. Just make sure you only look at the rod with only one eye open to avoid parallax errors. In any case it make motorcycle chain adjustment easier. Similar to how we just adjusted the chain tension, play with the nuts on the right side of the swingarm end to adjust the rear tire alignment. Constantly check the alignment to make sure you haven’t gone too far. Once you’re satisfied with the alignment, measure the chain tension again just to make sure you haven’t messed up its value. Then get ready to torque up the rear axle nut. It isn’t necessary to remove the sprocket alignment tool just yet, though. While it may be tempting to skip the torque wrench for this, the axle is the one place where you really should use one. 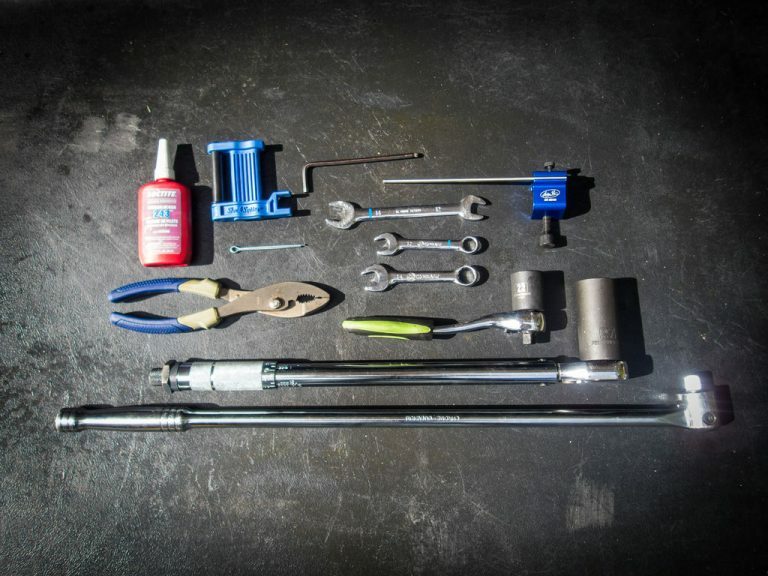 Set your torque wrench to a nice and tight 80 ft·lb. Tighten the nut side, not the axle bolt itself. Once the nut has reached the correct torque, tighten it a bit more until the nut aligns with a hole in the axle for the cotter pin to go through. The correct torque for the rear axle nut is 108 N·m (11.0 kgf·m, 80 ft·lb). You really should be using a torque wrench for this, honestly. But if not, it translates into pretty darn tight. It’s the same torque that is typically applied to a car’s lug nut. As before, we want to hold the bolt head steady while tightening the axle nut. Once we have brought up the axle nut to the right torque, we have to tighten it a bit more. Tighten until the hole in the axle aligns with one of the grooves in the nut. Sometimes during tightening things can go a bit whack. You always want to double-check chain tension and tire alignment one last time after tightening the rear axle. Just in case. When the nut is properly aligned with the axle, the cotter pin should slip right in. Bend it back in shape to avoid any catastrophic accidents. I put the cap back on to keep the cotter pin from shredding sponges when washing the bike. Reinstall the chain guard. Remember to apply threadlocker to the bolts. We’ve almost finished the motorcycle chain adjustment. Now that we’re sure that everything went well, install a new cotter pin and put its cover back on. When possible, avoid reusing cotter pins. The final step is to apply some threadlocker to the two allen bolts we removed previously. Then you can finally bolt the chain guard on. That’s it! The motorcycle chain adjustment is finished. Wasn’t that hard, was it? With this you’ll save plenty of time and money in the future. Given the frequency, it’s certainly a maintenance item worth taking care of yourself. And now you know how thanks to some random bloke on the internet. 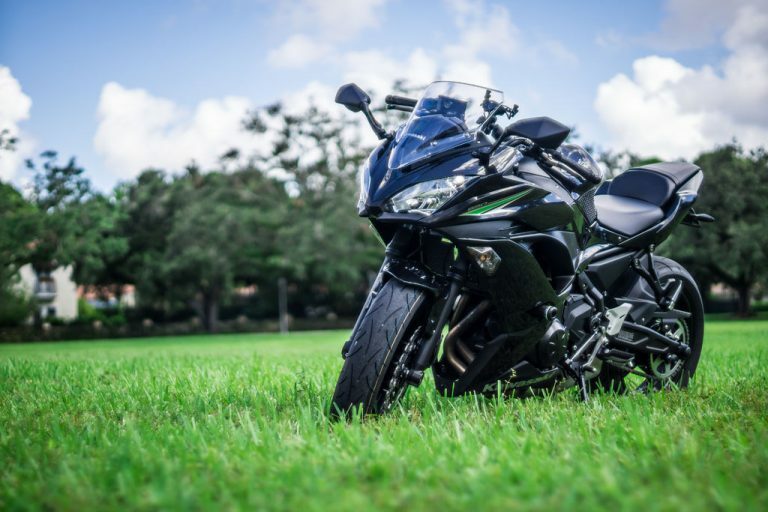 By the way, if you just bought you’re Ninja 650 and you’re still looking around for upgrades, check out my 2017 Kawasaki Ninja 650’s mods list. It’s a list of all the upgrades I currently have on the N650 pictured here. And plenty of them are even easier than doing this motorcycle chain adjustment. You might find something that you like. After all, what’s the point of a motorcycle if you don’t farkle it to death?